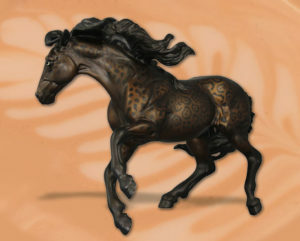 Home » Model Horse	» Breyer Java – Nokota Is The Next In The Big Cat Series! Breyer Java – Nokota Is The Next In The Big Cat Series! Similar to past Web Special Runs, I anticipate that cost for shipping for Java will be $17.50. I really like Java and will be entering with the hopes of winning the chance to purchase one! Fifth in the Breyer Big Cats Series, Java is a stunning panther. Panthers can be either black leopards, found throughout Africa and Asia, or black jaguars, found in South America. Melanism is the genetic term for the gene that causes the black variation. Jaguars are distinguished by spots within the circles in their coat pattern; leopards do not have this. Java is a black jaguar, and his breathtaking coat reflects an extensive spotted pattern. He will draw you in with his amazing coloring and golden green eyes! 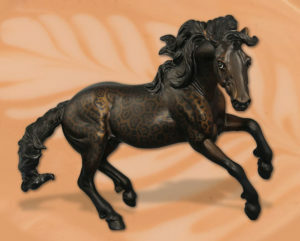 He features the Limited Edition Breyer Big Cat Series pad print on his belly in black. 2 Responses to Breyer Java – Nokota Is The Next In The Big Cat Series!